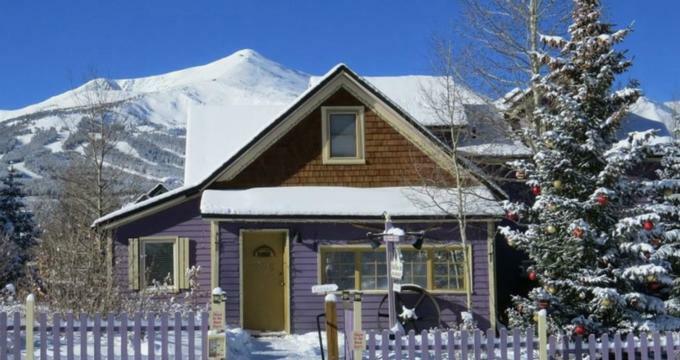 Set in a beautifully restored Victorian home, the Abbett Placer Inn is a charming bed and breakfast located in the heart of Breckenridge's historic district. Listed on the National Register of Historic Places, the elegant mansion is ideally situated for exploring all the attractions and activities that Breckenridge has to offer, and is within walking distance of several excellent restaurants and shops, as well as Riverwalk Music Tent and the Welcome Center. The Abbett Placer Inn features five well-appointed guest rooms decorated in a rustic Rocky Mountain style with comfortable furnishings, private bathrooms, fireplaces, balconies with hot tubs, and modern amenities. A delicious homemade breakfast is served every morning, along with a traditional afternoon tea, and a comfy communal living room offers books, games, and a guest computer with Internet access. The outdoor deck has a hot tub with hydro-massage jets and spectacular views of the surrounding mountains and is the perfect place to unwind. The Abbett Placer Inn features five well-appointed and comfortably furnished guest rooms with contemporary décor, plush furnishings and private balconies with stunning views of the Ten Mile Range Mountains. All rooms have king or queen-size pillow-top beds dressed in high-quality linens, down comforters and plush pillows, and en-suite bathrooms with showers and soaking tubs, or a combination of both, single vanities, fresh towels and bathrobes, and branded toiletries. In-room conveniences include electric fireplaces, sleeper sofa beds for additional guests, flat-screen televisions with cable channels and DVD players, MP3 radio alarm clocks, mini-fridges, hairdryers, irons and ironing boards, and complimentary wireless Internet. The Peaks Panorama Suite features a queen-size pillow-top bed dressed in high-quality linens, down comforters and plush pillows, and an en-suite bathroom with a rain shower, single vanities, fresh towels and bathrobes, and branded toiletries. A sitting area has a comfortable sleeper sofa and electric fireplace, and a private balcony boasts breathtaking views of the surrounding mountains. The Miners Shaft Suite is a spacious king suite furnished with antiques and enjoys access to the back deck and the hot tub through glass doors on the ground floor. The suite features a king-size pillow-top bed dressed in high-quality linens, down comforters and plush pillows, and an en-suite bathroom with a rain shower, single vanities, fresh towels and bathrobes, and branded toiletries. A sitting area has a comfortable queen-size sleeper sofa and electric fireplace. Settlers Saloon is decorated with antiques from the Old Wild West and features a king-size pillow-top bed dressed in high-quality linens, down comforters and plush pillows, and an en-suite bathroom with a rain shower, single vanities, fresh towels and bathrobes, and branded toiletries. This garden-level room has large windows which offer beautiful views of Bald Mountain in the background. The original bedroom of the house, Wildernest is a king-sized mini-suite that has been renovated to reflect Breckenridge's bountiful wildlife. The suite has a king-size pillow-top bed dressed in high-quality linens, down comforters and plush pillows, and a private bathroom in the hall with a shower, single vanities, fresh towels and bathrobes, and branded toiletries. Romantic Nook is a cozy bedroom located under the eaves of the home with a queen-size pillow-top bed dressed in high-quality linens, down comforters and plush pillows, and an en-suite bathroom with a rain shower, single vanities, fresh towels and bathrobes, and branded toiletries. A full breakfast is served every morning in the dining room and includes freshly baked bread, pastries and seasonal fruit, hot and cold cereals, hot and cold entrées, signature dishes, and freshly brewed coffee, tea, and juices. The Abbett Placer Inn features several amenities and facilities to ensure a comfortable and relaxing stay, including a comfy communal living room, offers books, games, and a guest computer with Internet access, an outdoor deck with a hot tub with hydro-massage jets and spectacular views of the surrounding mountains. A delicious homemade breakfast is served every morning, along with a traditional afternoon tea, and guests can relax on the deck with a drink in the evenings and soak up the views. The Abbett Placer Inn is conveniently situated within proximity to several Louisville landmarks such as the Louisville Zoo, Slugger Field, and Churchill Downs, home of the world-renowned Kentucky Derby. Two Louisville's finest shopping malls are located within a few minutes of the hotel, as well as the Atlantis Water Park, which is just 15 minutes away.